Mentors themselves aren’t extinct, the models under which they used to exist are. Now, it’s easier than ever to look to our peers for guidance. What made the traditional apprenticeship-style mentoring work was hierarchy. The master trains the young. The young blossoms under tutorship and becomes the master. The first master can finally retire to Florida, now that his legacy is protected and maintained. Repeat. Hollywood has been using mentorship as a predictable, romanticized trope for years; Luke Skywalker had Obi Wan Kenobi, Daniel-san had Mr. Miyagi, and Harry Potter had Dumbledore. And who doesn’t love to think there might be some unrecognizable potential, something very special in ourselves that only a wise mentor could help us find? It’s also easy to assume that your boss is meant to fill the mentor role for you. After all, they hired you. Most likely they are older than you, and they’re definitely more experienced. And they picked you out of the hundreds of applicants, after probably only meeting with you once or twice. They saw something that was a little more special in you than in the rest. But what a mentor’s role is, and how they’re found, has changed. There’s not much “grooming” of young, new hires for the boss’s own position these days, when the average stay at a company for employees is now 4.6 years in America (according to the United States Bureau of Labor Statistics). In the past, those mentorships were really apprenticeships, where someone showed you the ropes and skills of their own craft. We’re not being hired to be apprentices anymore, we’re hired to be multi-talented, autonomous creatives—and confusing the two modes can be a huge mistake. While this can put new hires in a sink-or-swim situation, the new generation has been built to handle it. Millennials are more self-sufficient than their bosses might assume; after all, we did grow up with internet search engines and Google tools at our fingertips. This isn’t to say that millennials are “better,” but that we’re all more resourceful than we might think. So while we know that we can do the work, it can still be a jarring experience for those who came in with expectations of a mentor to tell us what work we should do, and how to do it. Just as most of us would balk at the idea of an arranged marriage, there are no arranged mentorships waiting patiently for you. There are no CEOs or founders searching anxiously for a fresh college graduate to groom to take over their job one day. We’re not cogs in the career machine anymore. In the modern world, mentors aren’t given, they’re made. But here in the internet-obsessed Networked Age, hierarchy is increasingly flat. Not just in the organizational sense (as some companies like Medium and Zappos move away from managers altogether), but in the way that we connect to one another. It’s not person-to-person, but person-to-people. Networking is constantly listed as a necessary step in every article or book written about what you need to do to be successful—but no where will you find even one of them stipulating that the connections you make must be only to those older than you, or more experienced, or in your field, in order for it to be useful. Why keep craning your neck around in search of an “authoritative” (read: higher-raking) mentor, when you can look to the peers and colleagues right in front of you? Creative circles aren’t a new concept and have been around for decades: from the French post-impressionists Société des Artistes Indépendants made up of Seurat, Signac, Picasso, Cézanne, van Gogh and more, to the British writer’s group the Inklings with Tolkien, C. S. Lewis, and Barfield, to name a few. If it’s really expertise you need, build a network of mini-mentors: instead of one, all-holy, gate-keeping mentor, find a handful of people across industries and experience levels that you can look to for their expert advice in their fields. A symbiotic exchange lies at the heart of modern mentorships. Technology has been advancing at an extraordinary rate over our lifetime (the first web browser was only invented in 1994 and the first iPhone in 2007), so when it comes to technical knowledge, mentors have so much to gain from their mentee’s awareness of all things current and relevant. Look for a mentor not only by what they can teach you, but by what you can teach them as well. Think about it this way: In 1980, graphic designers were using rulers and pencils, while cutting and pasting by hand, to graft together their work using traditional hand-rendering and paste-up techniques that were the industry standard. By the time the class of 1990 graduated, the hand-done techniques were gone; they had learned how to design using computer software. This ongoing technological change created a workplace of diverse talents and skills, where the most experienced person in the room was a master of their craft, but lacking in the new technical tools even the greenest new hire came in knowing. Likewise, the “apprentices” of today have just as much to bring to the table as their mentors do. Industry wisdom, philosophy, and craft are invaluable—but so are the tools, fresh insights, and relevancy new hires come with fully loaded. Everybody wins. 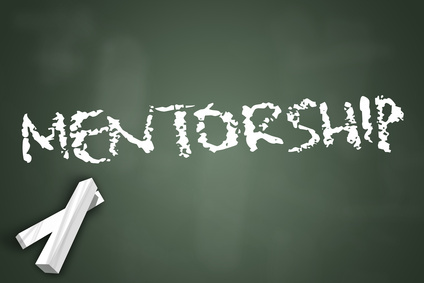 Through these new ways in which mentorship works comes a lot of freedom. Freedom to look beyond the person assigned to rank above you, but also an overwhelming amount of outlets through which to find your own as well. We’ve previously discussed finding mentors by traveling to communities outside your own, or looking across your social networks, or even by doing favors for others. And the good thing is, your mentor can still be your boss. The better thing is that it no longer has to be.